Preparations before our holiday in May offered the opportunity for another one of my All Done posts where I use up some fabric stash to its very end. I have sewn my way to holidays in the past: I have handmade swimsuits, shorts, cotton tops and a hat all ready to go every year. 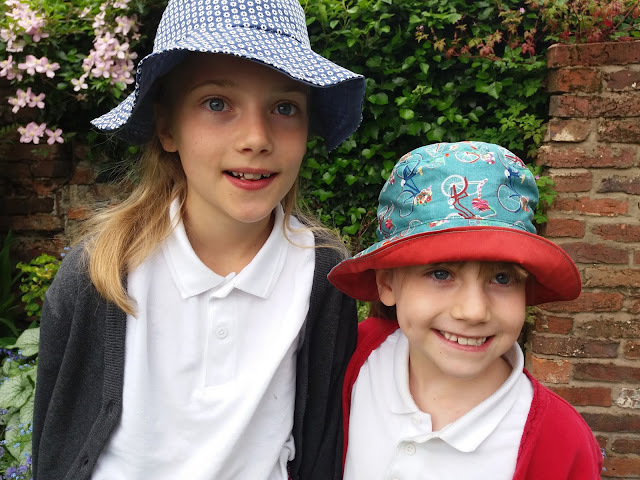 This year, I made a couple of hats for the girls and I thought with all this glorious weather I should share the free pattern links in case you would like to make one. 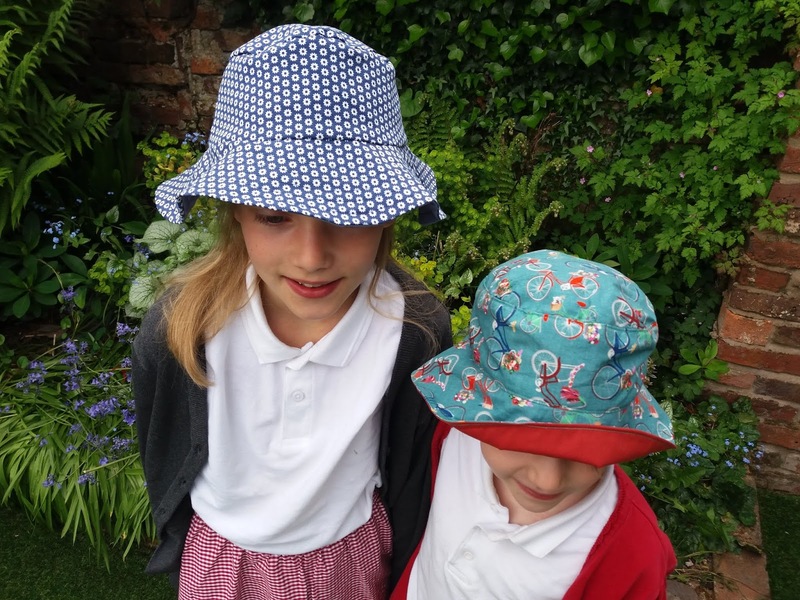 I have used two patterns. The bike one is a favourite shape because both girls have long hair which is often in a pony tail. It is from Love Sewing: issue 15. I used the left overs of my 1960's dress which has an air of french cycling about it. The blue one is made from a free pattern you can download from Oliver+s here. It only goes up to a large toddler size but I found a modified pattern on pinterest for a 21/22" version here which was great for Big sis. This is a stretch cotton, left from a pair of summer capri trousers, which made it simple to ease the crown onto the brim. They are gorgeous hats, love the fabric. 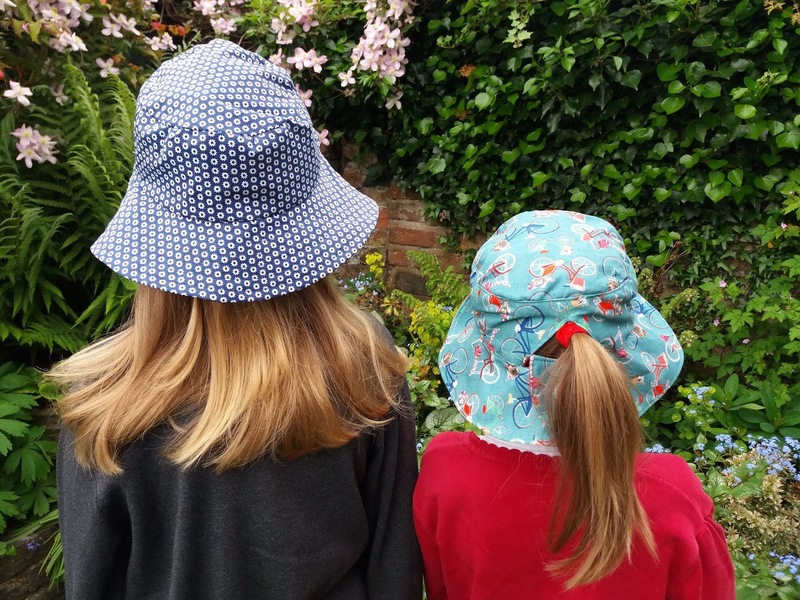 I am going to give this pattern a go, my grand children are always in need of a hat. These are adorable! Nice work! I love the idea of a ponytail hole, that's awesome. Little Sis looks just like you in these pics! I love these! The bicycle fabric in particular is lovely. Those hats are wonderful, and look how cute those girls are! Getting big too I might add. 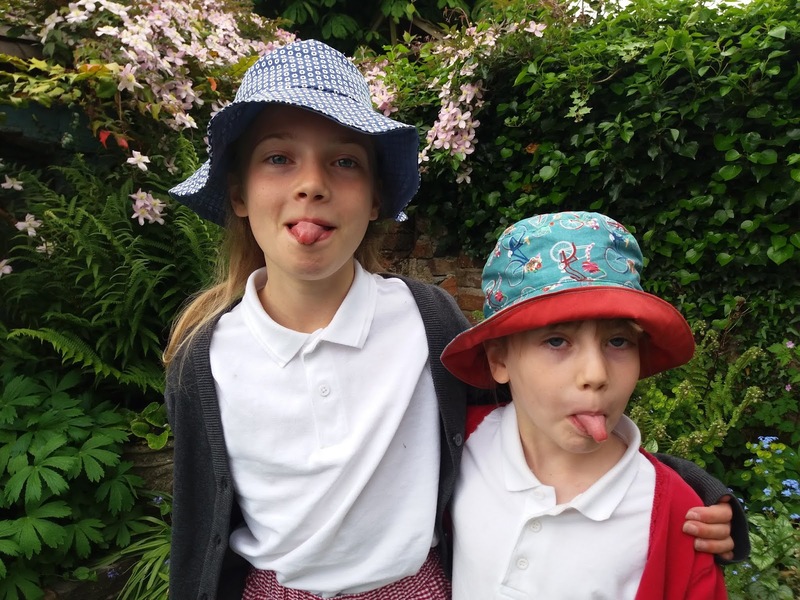 Hi Jo, Your girls look lovely [ and cheeky ] in their hats. Thank you so much for the pattern. I was so pleased with it. Never sewed a hat before. [ I'm 69 ] Made it just in time for my holiday, next week. My husband created a link for me ,so I can show it to you. > https://1drv.ms/f/s!Ai1rZdgazIOsgqcsyXP04hB7pWHpdA < Thank you again. Carol. Great hats and I especially like the opening for the pony tail.